Every year over the 4th of July weekend, the All-4-Fun Trail Boss coordinates a weekend for all to come and scout trails to be used during the All-4-Fun week August 2-9th. Dirk B. had some mechanical problems on I-70, but made it to the All-4-Fun camp. Trails are scouted for directions and other points of interest. Hobo Jed ' Clampett' McClelland (CJ7) came up on Thursday, and ran Champion Mill with other MHJC members along the Halfmoon Creek drainage SW of Leadville. On Friday, July 4th, myself (CJ7) & Mardi B, along with my jeepin-sidekick Molly arrived in camp with tent trailer in tow. We pitched camp and took a tour of the area. We drove around to the Fish Hatchery (closed-no fish), around Turquoise Lake, and up to the saddle below Mosquito Pass (still closed then). 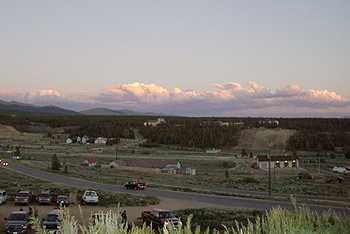 After dinner, we waited with all the Leadville locals for some fireworks at 9pm SW of town. On bright sunny Saturday morning July 5th, we prepped to leave around 8:30am to scout some trails north of Tennessee Pass. The one trail that leads to Zion Peak was closed due to the Camp Hale area being closed for unexploded bombs still found from when it was an Army base in WWII. So, we headed to check out the Wurts Ditch Trail, then over and up to Slide Lake. 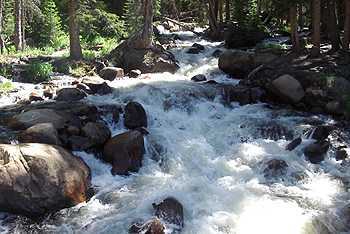 I found FR 705 just NW of Camp Hale off Hwy 24, and followed it up. It is an easy graded road for a few miles, then it turns into a 4WD road. Numerous fun small rocks abound, as you climb thru the Engleman Spruce forest. Spotty views tease you of the Holy Cross Mountains to your right (North), as you still climb and maneuver this tight trail. The Forest Service map is wrong when it shows all the trail to be easy and drivable by car. 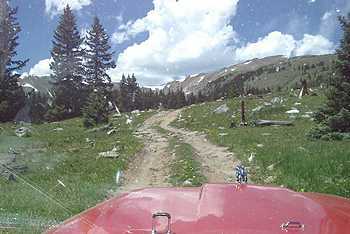 The Delorme Colorado Gazetteer is correct, as it does show the trail turning 4WD. We reached an intersection with FR 705.1 and followed it a mile to a dead end (parking for 4 max). 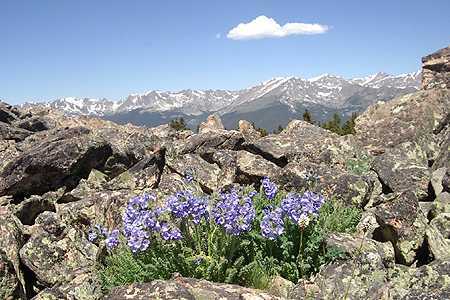 We took a short hike into the Holy Cross Wilderness, and found a great 360 degree view on a rocky outcrop. From the Holy Cross Mountains to the North, Collegiate Range and Leadville to the South, and Vail Pass/Climax to the East, the views were wonderful! Columbines and other wildflowers made nice foreground for some photo opps. We headed back to FR 705 and reached the other side (easier section) just south of the Yoder Gulch Trail intersection (Yoder Gulch looked fun coming up). Pressing south, we finally reached the Slide Lake trailhead (FR 145) and headed west towards the lake. The Slide Lake Trail is about 2.5 miles long. It's the kind of trail that dictates to you on how fast (or slow) you can 'run' it. Many, many small to medium sized rocks are everywhere! They are round and half buried. Either you go along as the trail gives you (speed wise), or you get bounced around twice as hard! Good trail to break in your shocks and suspension, and easy enough for a stock vehicle with larger tires. I stopped (parking on a dirt patch off the grass) in a nice meadow (the lower meadow) for lunch along a small creek. The meadow provided some breeze to keep away the many mosquitoes who resided there. Bring bug repellant, you'll use it. 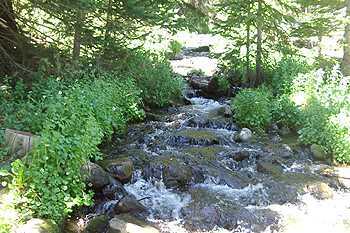 Heading on up, we passed the upper meadow (past 1st creek crossing-photo below), but since the rains have stopped, the normal array of wildflowers were absent. Soon, we made it to a 2 campsite turn-around spot and parked. We took an easy .25 mile hike up to Slide Lake (a must). The lake was full and blue! 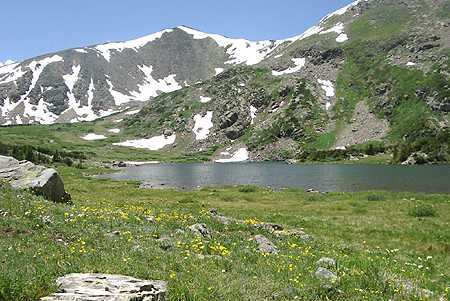 The yellow flowers and white snow banks contrasted with the green fields of grass and Colorado blue sky....nice! The trail is an 'up & back', so we headed on down at a snails pace (or risk bounced out of the Jeep), and finally reached Hwy 24 south of Tennessee Pass. There is some free kick A$% air at the Amoco station on the north side of Leadville! Mardi & I headed for the showers (green building near Safeway-$5), then off to dinner and back to camp. We shared some fire and friendship with Patrol 5, 2, and 14 before calling it a great day!